Madelyn (aka Technology-Is-Hard-Barbie) will no longer be the editor of Handwoven. I knew that lifetime subscription would pay off eventually! Her last column is an ode to why she should never have been an editor in the first place. I also smiled when I saw the shadow weave circles throw in that issue - been there, done that, but I think I like the draft I used better. It has bigger circles and smaller pointy bits. Glad they featured shadow weave, though. It's a lot of fun. And my reason for the season: at this latitude, today is 8 seconds longer than yesterday. Yippee! Here is Flipper on the new stand. I'm about halfway through the shawl and want to be finished in time to twist the fringe and wash it tomorrow. The dark stripes are alternating medium gray and green which are so close in value that I had to be careful with the lighting while measuring the warp to be sure I had the right order. The swatch was just about perfect: even selvages and square, but drapey, sett. I'm wrapping stripes to decide what the final version will be. Also, the stand for the Flip arrived today, though I'm not sure I'm in the mood to do more tonight than count hardware. And lastly, I got an email from a very dear friend with a picture of his newborn granddaughter wrapped in the Aran blanket I knit for his son in 1981. I'm so amazed that it was in such good condition and that they still had it. Actual weaving! Here is my new toy, a Schacht 20" Flip rigid heddle loom. It's inexpensive, well designed, well built and fun to weave on. Plus it was made to use two heddles, so you can weave at setts from 8 epi to 24 epi (once you collect the full range of heddles). I did buy the travel bag for it, which is handy to keep assorted four-legged critters and their hair out of the warp, and I will eventually buy the trestle stand. For now, I clamp it to the grooming table, which is exactly the right width, and weave standing. This first sample is 80% merino / 20% cashmere that I bought in bulk many years ago in several colors from Webs. He's much better about spinning. Two or three weeks ago, he supervised the cleaning and oiling of my wheel with great interest, and then tried the late Mr. Bear's method of resting his head on my foot while I treadled. Buki, like Bear, gave up after a while, but he did sit off to the side watching the wheel more or less quietly for a long time. That let me spin about a half bobbin of Montadale. It also reminded me that I need to order a new oil bottle, because one critter or another punctured the old one. I did manage to knit and felt this small bag yesterday, though. Now that the weather may get warmer (yuck!) and I won't be wearing a jacket with many pockets, I need something small for my cell phone, iPod, etc. This is a smidgen bag knitted from leftover Schaefer Elaine and felted to within an inch of its life. Noodling along on the wrap/shawlie thing. It's too big for the bus, and my time at home has been spent working on paying stuff. The next project is a baby set of blanket, sweater and hat. Unless of course something else gets in the way first - for example, I've had an urge to tune up my spinning wheel and dive into the lovely Shetland fleeces I washed and stashed some time ago. 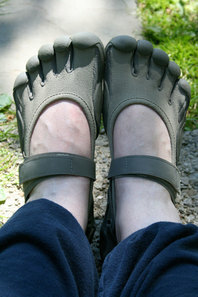 More FiveFingers! And a nice place to buy them is gotyourgear.com. I've been wearing them a lot and I have such happy feet! On the fiber front, I did buy a bunch of the Webs cottolin. It makes me wish I were a machine knitter because I could whip off a bunch of summer tops in a real hurry. Still, I will sample for the huck bath/hair towels soon, perhaps over the weekend of the 4th. Also, I should have a new shawl/wrap pattern available for sale shortly. It's fat(ish) commercial yarn and thus is knitting up pretty quickly. And it will be on Ravelry (my id is cdevine). I broke down and joined because a whole bunch of my patterns were listed there. Of course, hell will freeze over before I list stash, projects, and such. When I weave bath towels, I almost always use huck. Aside from the sheer fun of getting many treadling variations on a single warp, the floats mean the towels dry faster. I've got a bunch of hair towels (they're just big enough to wrap around a head) that I've been using for years, and I also made a set for my mother and sister. The Five Fingers are wonderful. I've walked over gravel, asphalt, grass, wood and concrete, both dry and wet, with wonderful grip. I've got a nice blue/tan/brown colorway in Schaefer Anne for a pair of toe socks - toes are much shorter than fingers, so I'd rather knit toe socks than gloves any day! So, no postings in a while, because I've been insanely busy with paid work. But now that it's warm enough to knit while waiting for the bus, I decided to wind off a skein of sock yarn for a commuting project. Unfortunately, it was a badly wound skein, so it took more than an hour to untangle four ounces of yarn. Sigh. Fortunately, I let the left brain/right brain split take over: the left brain snarls and swears at the tangles while the right brain and hands placidly untangle the mess. Of course, once I'd finished, I decided that the stitch pattern I want to use needed a different colorway, but that skein was less trouble. It's been snowing like crazy, and this is one of the maples outside the front door, photographed hand-held at night. Given the weight on the branches, I'm contemplating keeping the heat up a bit overnight in case the power goes out. The gloves are finished (in fact, I've been wearing them everyday for the last week and a half) and I've been knitting swatches with the Webs tencel/merino. Interesting stuff - I can see a spring cardigan in a stitch pattern that maximizes the shine. 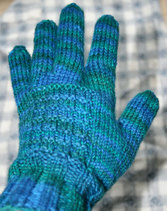 I used the excuse that I lost a Polartec glove to knit a pair rather than work on the shawl. Here's glove #1. #2 is up to the pinkie and should be finished in time for the morning.